Christian Adams off and running for AIC. Steven Zomberg photo. As exhausting as traditional rugby can be, there is no doubt that 7s requires an even bigger gas tank, testing every player’s limits; at American International College, Head Coach Rob Guiry makes sure that his players are fit and ready for the physical demands that come along with 7s. Everybody plays 7s for AIC. Steven Zomberg photo. To make sure the Yellow Jackets are making progress, they are tested at the end of every semester. “We compile player’s max output for three reps in squat, dead lift, bench press and clean, as well as 40-meter dash time, bronco time and vertical leap. We also take the players height, weight and BMI,” said Guiry. 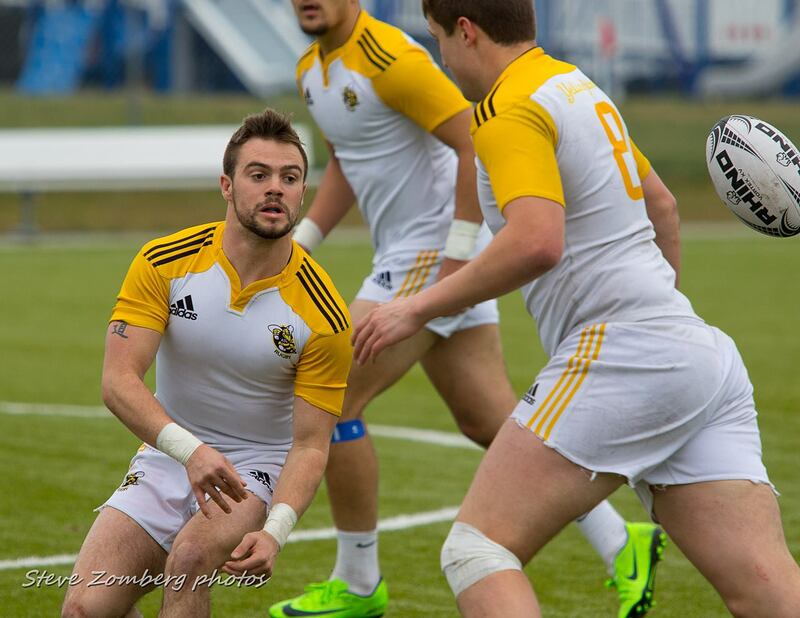 Keeping track of player’s numbers in the weight room and on the field is a unique approach that could help give AIC a more accurate approach to 7s. Another unique tactic that Guiry employs is encouraging the whole team to participate in 7s. “From our biggest prop on down, everyone on the team is learning how to play 7s, increase their catch-pass skills and get more fit,” explained Guiry. One reason for this is because the Yellow Jackets have a lot of players new to 7s, so having a lot of depth and players with different skill-sets helps bridge the gap on inexperience. As far as gameplay is concerned, Guiry acknowledged that 7s is drastically different from 15s. He stated that 7s is a simple game that is oftentimes made difficult by coaches. To keep things more on the simple side, Guiry stresses the importance of executing simple rugby principles and adding some creativity when the opportunity arises. So far this Spring, the Yellow Jackets have entered three tournaments, and three times they have walked away victorious with a combined score of 73-5. With these impressive wins and the determination and numbers that AIC possesses, a National Championship could definitely be in their horizon.